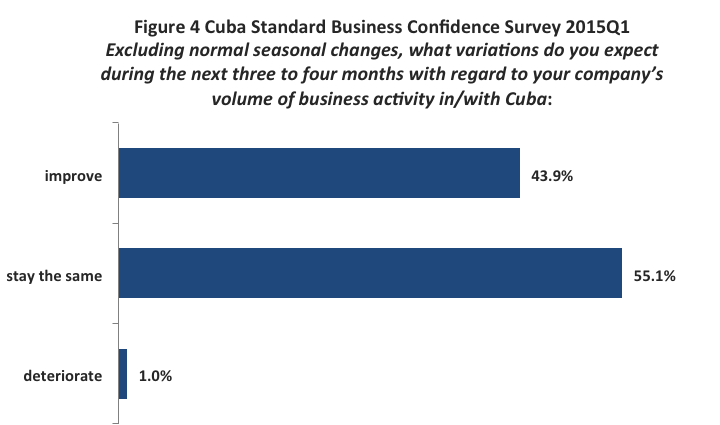 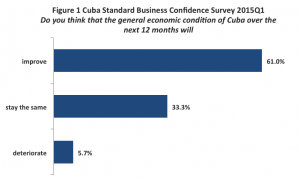 In this first quarter of 2015, we are presenting the Cuba Standard Business Confidence Survey, the first poll of this kind used in Cuba. 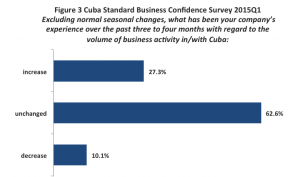 The objective is to provide a proper way of measuring entrepreneurs’ and analysts’ perceptions and expectations of trends in the economic activity in Cuba. 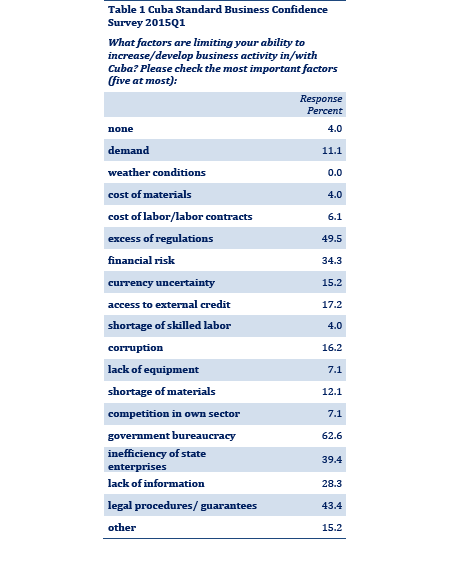 The survey consists of eight questions; respondents select their answers from a group of options. 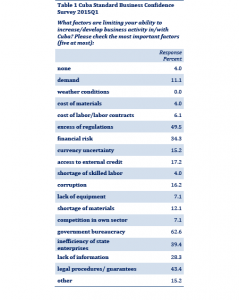 For the design of the survey, we based ourselves on international standards presented in the 2003 OECD document titled Business Tendency Surveys: A Handbook. 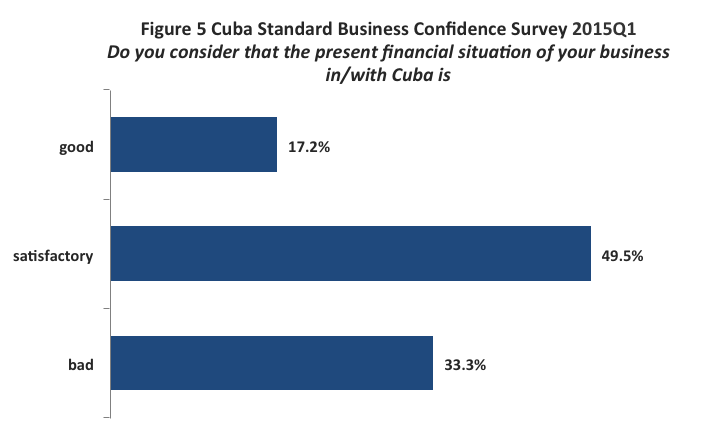 The survey — exclusively available to Gold Membership subscribers of Cuba Standard — will be conducted quarterly via email to a random sample of around 100 businesspeople and analysts connected to the Cuban economy. 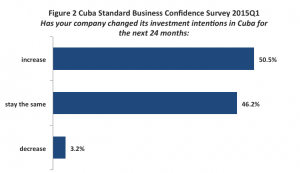 The results measure in a qualitative way the business climate in Cuba and allow the construction of a confidence or economic optimism index. 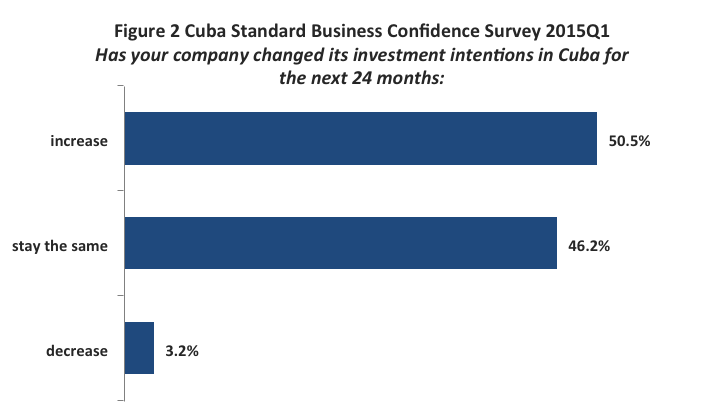 We will build the confidence index beginning with the next quarter as we get the results of our second survey. The idea is for the Cuba Standard Economic Trend Report to count with two types of indexes in support of its analysis and projections: 1) the Cuba Standard Economic Trend Index (CSETI), based on quantitative information, which tries to detect month-to-month GDP trends using data from variables linked to the balance of payments (we launched this in the third quarter of 2014), and 2) the Cuba Standard Business Confidence Index, which tries to measure the business climate based on qualitative information collected in the survey. 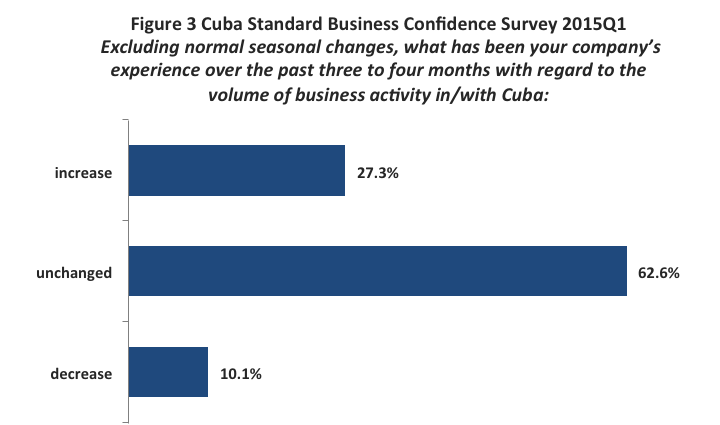 In the first quarter of this year, the survey was answered by 106 persons, and it has the added value of having been performed just a few weeks after President Barack Obama announced a policy change towards Cuba.